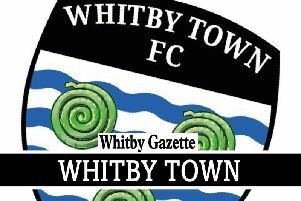 Ryan Brobbel has cited the prospect of playing European football as the reason for his move away from Whitby Town. The former Middlesborugh FC man has swapped the Turnbull Ground for Welsh Premier League outfit The New Saints after four months as a Blue. “The offer from TNS was full-time football, which is what I’ve been aiming to get back into since leaving Middlesbrough, while the opportunity to play in Europe was also a big selling point,” Brobbel told the Whitby Gazette. “I’m hoping to help the club win the Welsh Premier League again, and then see how far we can get in either the Champions League or Europa League next season. Brobbel arrived at the club in late September and went on to make 18 appearances in a blue shirt, scoring four times. He made his debut from the substitutes’ bench at Halesowen in early October, and admits that it took him some time to adapt to Evo-Stik League football having been used to playing for Middlesbrough’s under-21s and for York City and Hartlepool United in League Two. “The step down to non-league has been quite tough,” he continued. “I’m the type of player who likes to get the ball down and play, and the pitches at this level sometimes aren’t the best, which makes that more difficult, plus you come up against a lot of big and very physical opponents. “That said, I’ve still had a good time at Whitby, particularly since Chris [Hardy] came in and we started picking up results. “The lads are great, there’s a nice atmosphere at the club and things are a lot more organised that I expected them to be at this level. The 22-year-old’s move to Wales came about after he was recommended to TNS’ manager Craig Harrison – an ex-Middlesbrough player – by Paul Jenkins, Brobbel’s old Boro under-21s coach. Another coach who rated Brobbel highly was his gaffer at Whitby, Chris Hardy, who said he was “disappointed” by the player’s departure. “Brobz’s departure is a bit disappointing because he was a player who I felt offered us something different. “We’re in a dogfight at the moment and we need as much quality in the squad as we can get. “However, Ryan’s personal goal was to get back into full-time football, and once the offer came from TNS, he had to take it, it’s a great opportunity for him.